We do so not with empty howls of protest (even the heathens, heretics, and Jews can do that), but rather as true soldiers for Christ the King – members of the Church Militant, outfitted with truth and well grounded on the firm foundation of Catholic tradition. In order to prepare for battle, please avail yourself of the resources below. They are being made available here free of charge. I only ask that they not be reprinted for sale, and that you please consider making a donation should you find the content helpful. Please check back from time to time as more resources will be made available in the future. 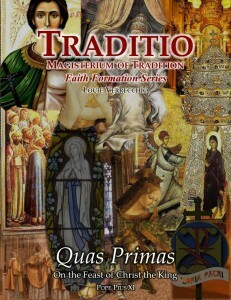 Traditio Faith Formation Series: Quas Primas The Encyclical of Pope Pius XI is reprinted herein (© Libreria Editrice Vaticana) in its entirety, along with insightful commentary, followed by three lessons with Scriptural references that aid participants in coming to a firm understanding of the immutable doctrine concerning the Kingship of Jesus Christ. Suggested responses are included. Suitable for both faith formation groups and individuals alike. The content of this study guide has been deliberately kept on a highly approachable level. It is ideal for sharing with those who are either new to tradition, or entirely unfamiliar with the Social Kingship of Our Lord Jesus Christ. 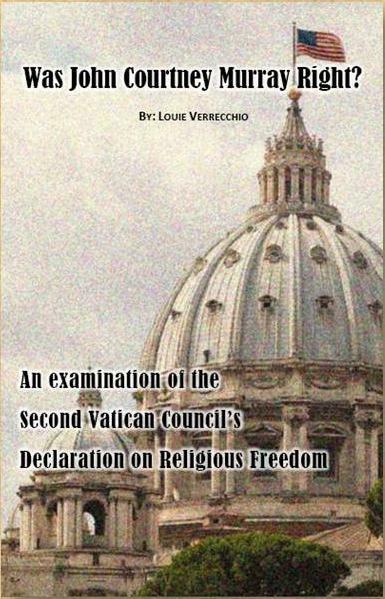 Rather than focusing on minutia, Verrecchio shines the light of Tradition on the foundational planks upon which these two disparate approaches to religious freedom must either stand or fall, providing readers with the insight necessary to decide for themselves: Was John Courtney Murray right?